Which of the following means that N is the maternal uncle of M ? 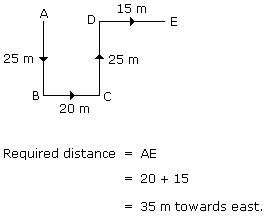 E - M means E is the sister of M.
"A"walks 20 km towards North. He turns left and walks 40 km. He again turns left and walks 20 km. Finally he moves 20 km after turning to the left. He is facing towards in which direction to his starting point ? So, he is facing towards east direction. Vivek started to walk straight towards south. After walking 5 m he turned to the left and walked 3 m. After this he turned to the right and walked 5 m Now to which direction Vivek is facing ? Hence, Vivek will face in the end towards South. 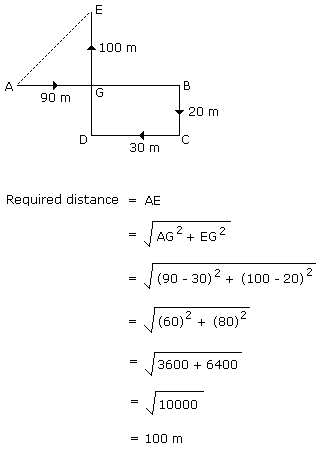 A direction pole was situated on the crossing. Due to an accident the pole turned in such a manner that the pointer which was showing East, started showing South. One traveler went to the wrong direction thinking it to be West. In what direction actually he was travelling ? Explanation : The answer is North. One evening before sunset two friends X and Y were talking to each other face to face. If Y's shadow was exactly to his right side, which direction was X facing ? Since at the time of sunset the shadow of two persons must fall in the East side. So two persons are must facing either South or North. Hence, X was facing towards South. One morning after sunrise, A and B were talking to each other face to face at a square. If B's shadow was exactly to the right of A, which direction B was facing ? Since at the time of sunrise the shadow of two persons must fall in the West side. So two persons are must facing either South or North. Hence, B was facing towards North. A child went 90 m in the East to look for his mother, then he turned right and went 20 m. After this he turned right and after going 30 m he reached to his uncle's house. His mother was not there. From there he went 100 m to his north and met his mother. How far did he meet his mother from the starting point ? One morning after sunrise, Sunil was standing facing a pole. The shadow of the pole fell exactly to his right. To which direction was he facing ? Prakash walked 25 m towards south. Then he turned to his left and walked 20 m. He then turned to his left and walked 25 m. He again turned to his right and walked 15 m. At what distance is he from the starting point and in which direction ?